Don Quixote (Edward Hightower) is dubbed “Knight of the Woeful Countenance” by the Innkeeper (Anthony Aranda) as Aldonza (Rachael Richman) and Sancho Panza (Dave Leon) look on in astonishment. Photo credit: Jay Yamada. Evidently, director Katz loves this old warhorse enough to dream the impossible dream of making it work on CustomMade’s postage stamp of a stage. 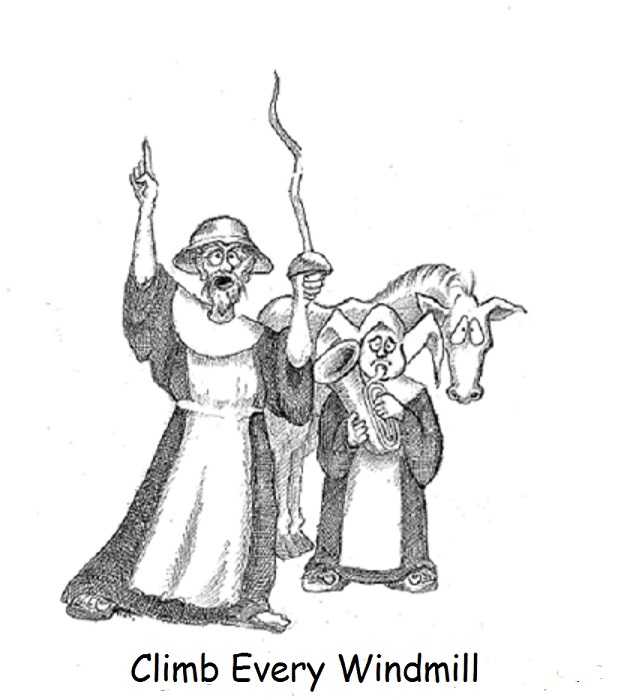 To tilt at this particular windmill, he reduces the bombast to a minimum by simplifying the score as much as possible. Indeed, it is performed not by a pit orchestra, but by the acting company, themselves, sometimes using toy instruments. At one point Sancho Panza performs an entire number accompanied only by himself by punctuating the song with a tuba, between verses. Musical Director Mark Dietrich and arranger Brian Allen Hobbs deserve a great deal of applause for this clever adaptation. It works because Edward Hightower, one of the Bay area’s leading musical comedy performers, is a superb Don Quixote. He knows how to play in the small space, avoiding bombast in favor of a simple, straight forward honesty that is quite moving. He surprises us by underplaying a role that is almost always overplayed, and it is wonderfully refreshing. As Sancho Panza, Dave Leon is perfectly type cast, and plays every joke to the hilt. Also a standout is Anthony Aranda, who beings exceptional depth to his characterization of a compassionate innkeeper. As Aldonza, Don Quixote’s lady love, Rachael Richmand also avoids bombast and brings a usually stereotypical character into full life. The remaining chorus, playing multiple characters and instruments, performs with straightforward enthusiasm. It all works. In this case, less is more, and even if this too sweet and sentimental confection leaves you with your teeth aching, you’ll nevertheless be likely to exit humming the tunes, and feeling a bit happier and perhaps more hopeful than when you came in. Not bad for any night out at the theatre. 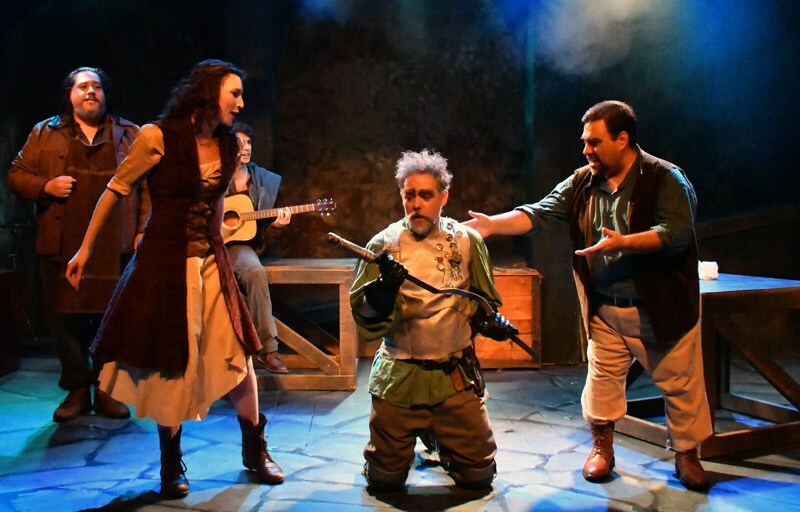 “Man of La Mancha” plays at Custom Made Theatre Company through February 17th. For further information, click here. “Man of La Macha” by Dale Wasserman, music by Mitch Leigh, lyrics by Joe Darion. Produced by Custom Made Theatre Co. Director: Brian Katz. Musical Direction: MarkDietrich. Music Arranger: Brian Allan Hobbs. Scenic Designer: Daniel Bilodeau. Costume Designer: Lindsey Eifert. Lighting Designer: Maxx Kurzunski. PropertiesDesigner: Tom O’Brien. Sound Designer: James Goode. Movement Choreographer: Nicole Menez. Fight Choreographer: Kyle McReddie. Governor/Innkeeper/Percussion: Anthony Aranda. Prisoner/Flute: Kimberly Cohan. Spanish Guitar: James Grady. Cervantes/Don Quixote: Edward Hightower. Prisoner/Muleteer/Melodica: Paul Hogarth. Prisoner/Viola: Emily Jeanes. Sancho Panza/Euphonium: Dave Leon. Prisoner/Maria/Housekeeper: Jenny Matteucci. Prisoner/Antonia: Emma Onasch. Prisoner/Muleteer/Padre: Jack O’Reilly. Aldonza:Rachael Richman. Prisoner/Barber: Shelby Stewart. Duke/Muleteer/Dr.Carrasco: Mauricio Suarez. Posted in Reviews.Tagged brian katz, Charles Kruger, Custom Made Theatre Company, Edward Hightower, Man of La Mancha, san francisco bay area theatre reviews, theatrestorm.